What lies behind the human urge to collect things? What is the true psychology of the kleptomaniac? These questions bear on all of us; within every person there lurks a fanatical philatelist or a monomaniacal lepidopterist, just waiting to burst forth. 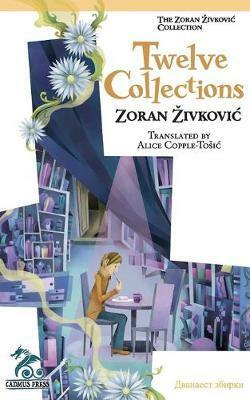 In his new story cycle, Twelve Collections, Zoran Zivkovic, the master of mind-bending surreal fantasy, applies his fertile mind to this problem. Some of Zivkovic's characters are lonely eccentrics, driven to gather unusual objects by quirks of temperament or fate; others are the victims of metaphysical collectors from Beyond, entities eager to snap up memories, emotions, and other loose fragments of the soul. ...characters living on the extreme margins, whose bizarre and obsessive behaviour crystallises deep truths for us. ...each tale is a gem of ironic humour and, as always, Zivkovic redeems everything at the eleventh hour with a climax of revelatory beauty. The short novella at the end of this collection, The Teashop, is a delightful bonus, a sort of distillation of the storytelling principle honed throughout the previous four books: endless storytelling as a form of redemption, even, for its protagonists, as a kind of immortality. --Tamar Yellin, Infinity Plus ...an amazing reading experience. ...Each of these twelve stories comes together as a cohesive whole creating a wondrous and spectacular novella that will leave you breathless by the final tale. [The Teashop is] an inspiring tale that touches on the magic of storytelling and the far-reaching lines of fate's web. ...the perfect conclusion to a book filled with miracles and curiosities. --Joe Kroeger, Horrorworld The crystalline prose of suite and stand-alone alike makes the stories exquisite to read.